With over 500 million Tweets sent per day, the idea of trying to find anything specific on the platform can seem like an impossible feat. However, when using Twitter for business purposes, the last thing you have is time to waste sifting endlessly through this barrage of content. Thankfully, Twitter has a built-in tool that helps streamline this process and potentially save you hours of time and energy. Using Twitter’s Advanced Search, you are able to easily narrow your search and find the information that matters to you. With social media a major lead generation source for businesses, Twitter’s Advanced Search tool makes a potentially painful process as streamlined as possible. As “lead generation is about collecting information from potential clients that can be passed onto your sales team,” a platform as chock-full of information as Twitter is invaluable. To help you get the most out of Twitter’s Advanced Search for your lead generation purposes, we’ve compiled the following guide. For information on how you can use advanced Twitter search streams on Hootsuite for these purposes and more, check out our blog post on the topic here. The easiest way to get started with Twitter’s Advanced Search as a lead generator is to use it to search for keywords and hashtags related to your business or industry. With this, you will find a whole community including anyone who is talking about your field. For example, if you’re a clothing company, you could search for a keyword such as “fashion” or a hashtag like the popular “ootd” (outfit of the day) to see what consumers are talking about and sharing. You are then privy to real-time results and conversations centered around a topic relevant to your business. Through this tool, you can then set other parameters for your search to further narrow it, and find highly relevant prospective customers. After entering the keywords or hashtags in the search boxes, sort through the results to find users who are talking about your industry or any related field. If you believe the users are active, engaged, and could potentially benefit from your product or service in the future, follow them and engage in (non-intrusive) conversation. If they have questions, answer them and prove yourself and your brand as a valuable and trustworthy voice. To search by area when using Twitter Advanced Search, simply scroll down to the “Places” heading and you will see an orange box with your current location in it. You can search for Tweets that were sent from the nearby area, click on the box and choose one of the suggested nearby areas, or type in a completely different location. You can, of course, select or fill-in any of the other filters to narrow your search even further, but by simply selecting a place to target your search, you will be able to see all Twitter discussions happening at a local level. When looking for high-quality leads, being able to combine a variety of the filters available on Twitter’s Advanced Search is a great skill. One of the filters that is especially useful as an additional way to sift through results is the one that measures sentiment. When you are performing an Advanced Search, you can check off a box that will show Tweets with either a positive or negative sentiment. When you conduct a search based on sentiment you are easily able to see what your customers and community are saying about your business, industry, or any keyword you focus on. For example, you could search for positive Tweets mentioning your business’ Twitter handle to see what your customers like about your brand. For lead generation, this is incredibly valuable information. It’s much easier to reach out to a user who is a fan or ambassador for your brand than the alternative. However, a feature that may be even more valuable is the ability to search for Tweets that are negative in tone. With this, you can see what the pain points and main complaints your customers and audience have surrounding not only your product, but your specific industry. This gives you valuable insight into what direction your content strategy should take, as well as allows you to jump into conversations where people are having bad experiences or issuing complaints. When appropriate (i.e. only enter a Twitter conversation when what you are adding is valuable, not when you just want to insert your company, which can come across as spammy), you can respond to Twitter users with solutions to their complaints, and, in doing so, open up a conversation that has definite potential to become a lead. When you bring awareness to your brand as a trusted authority, you attract relevant customers to you rather than having to chase or spam individuals in the desperate spray and pray model (where you just mass spread your message with the simple hope that it will stick somewhere). In the same area of the Twitter Advanced Search page where you found the sentiment filters, there is also a box that allows you to search for Tweets that include questions. 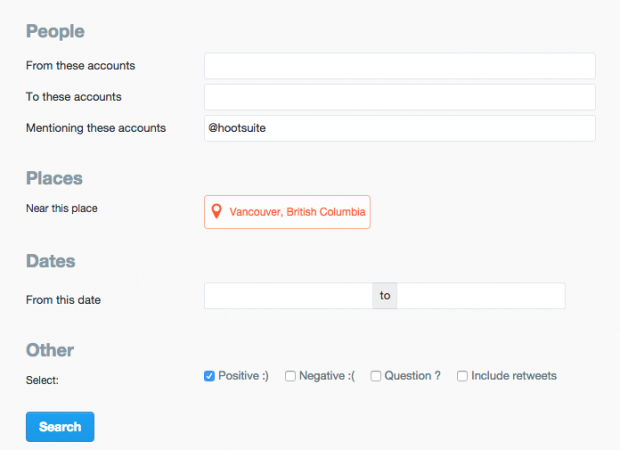 Similar to the sentiments search query, the questions filter allows you to easily find Twitter users who are possibly having issues or concerns within an industry or field. If you can find somebody asking a specific question about something you can expertly answer, you will raise your brand’s authority and trustworthiness by association. Explore the kinds of questions being asked, whether about your brand specifically or simply related topics, and position your company as the primary authority on the subject. By offering helpful suggestions and solutions to questions posed by Twitter users and engaging in high-quality interactions, you are definitely increasing your chances of gaining followers and with these followers, future customers. As Social Media Examiner declares, “Username search queries are one of the best ways to track new leads and learn about your market.” On the Twitter Advanced Search page, the filters “From these accounts” and “To these accounts” lets you see Tweets sent to and from specified accounts, which will help you quickly find out what certain users are saying to a brand, as well as what certain brands and organizations are saying themselves. For example, if you are a local baked goods distributor trying to find out where potential customers are, a great way to figure this out is by searching what specific influencers in the food industry are talking about and sharing. Furthermore, through seeing what these influencers are saying, you can see who is engaging with them and taking part in these discussions, allowing you a front-row seat to a whole group of active leads. One of the most worthwhile ways to use Twitter’s Advanced Search is to monitor and identify your competition’s activity. Use the keyword or hashtag search tools to listen to what conversations are taking place, and to see which other companies and brands are chiming in. Alternatively, by combining a search for a specific competitor’s username, along with a negative sentiment, you can easily see what their customers are less than happy with and use this information to highlight how your product or service solves these problems. Engage in the conversations surrounding your competitors in a respectful and non-spammy way and in doing so, bring positive attention to your brand. While I’m not advising you to blatantly poach customers from under your competition’s noses, offering up your organization as a valuable member of the industry will undoubtedly bring you new followers and connections, who can in turn develop as quality leads. In taking this approach, you are allowing potential customers to be guided to you through the content you are sharing on Twitter, as well as your input and participation in conversations with your competitors. I can’t stress enough that I’m not suggesting you reply to Tweets with blunt sales pitches, but rather that you offer up helpful information when appropriate. With Twitter Advanced Search, the process of finding quality business leads is more streamlined than ever. Using basic Twitter best practices such as focusing on engagement and the sharing of valuable information, you will have a roster of new potential clients, customers, and audience members before you can hit that Retweet button. 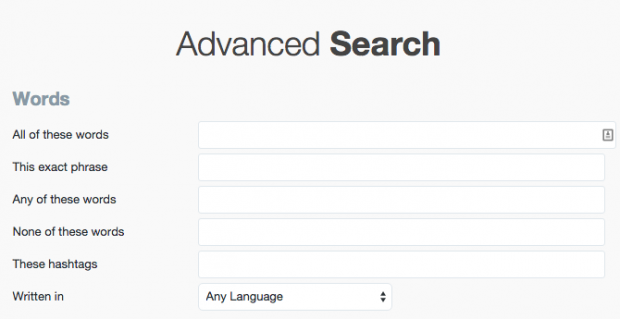 Start using Twitter’s Advanced Search with Hootsuite. Try it free today!